I think sketchbooks are so fascinating. Honestly I enjoy them more than refined, finished artwork. 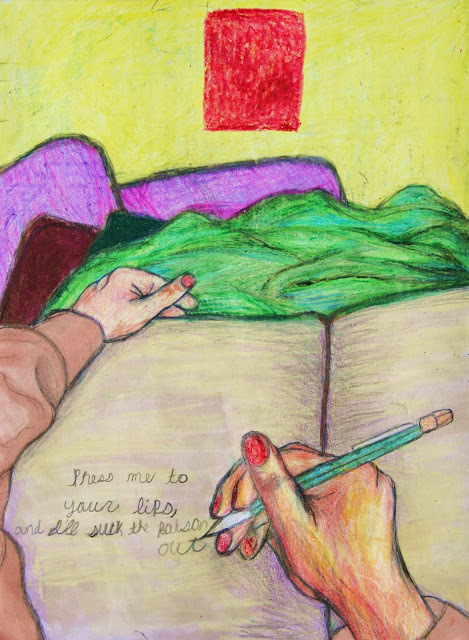 I love finding artists that use sketchbooks, the pages always tell a very personal story about that individual's life. Flipping through these books will reveal old ideas, lists, project outlines, and personal notes... they serve as a autobiographical snapshot of the artist's life. Alas, more often I find that many artists own a sketchbook, but never use it. They're always either barely touched or have a million torn out papers and scribbled out drawings. I've finished 9 sketchbooks since 2004, (red) one in progress! It's truly a shame, because I have found great value in using a sketchbook. I have actively been keeping one since I was in middle school, when I discovered I needed to put all my doodles and thoughts into one place instead of crumpled notebook paper. Looking back now, I already am thankful for keeping up with it for so long. I simply wouldn't be able to function as an artist without it! I use it to flesh out project ideas, for references, practicing, and often to cure boredom. Believe it or not I've used it as a social crutch... working on a radical drawing in your book is a great conversation starter. Your sketchbook can even make you money- I have earned several commissions just because of the diligent work taken from its pages. The back of my first official sketchbook named Pinkerton. I, of course, take everything to the extreme and really went crazy with my sketchbooks. They're awesome to look back on now because I did a lot of cool drawings/sketches through the time I've had them. I also name and decorate all my sketchbooks, by the way, it's just part of my "ritual." The names are mostly random, but I secretly like to believe that the books choose their own names. Weirdly enough, many of them actually reflect how I was actually feeling in real life at the time. Here is some of the random work from my 9 sketchbooks. I love seeing how I've grown and what kind of stuff I was doing at the time. For AP Studio Art class I had to do some stupid sketchbook assignments. Here's an over zealous self portrait! Ooo I was such a bad kid. I drew this in after school detention. The frog is retelling a tale from its childhood. A class assignment requiring me to talk about my idols and art shows I've been to. I had to do SHT! My mind is organized. Two of my favorite geeks on the same page. This is close to how I looked my freshman year, minus the fruit. One of the few sketchbooks with a torn out page in it. Didn't happen often! Oh, I forgot to mention my massive sticker collection I keep in the fronts and backs of all my sketchbook. It's probably more impressive than my artwork! I collect tons of them.. But that's a whole other story for another time. Here's a little taste of what I have in store for a future post.. Check out my stickers! If you aren't keeping a sketchbook yet, I hope you will find inspiration to start one soon. It's never to late to start. It's an outlet for your thoughts, but it also serves as a milestone in your artistic development. To be really artsy fartsy about it, it shows how far you've come and how far you still have to go. One last thing I think people should remember about sketchbooks is that they are perfect because they are imperfect. Our imperfections as people are what make as fascinating, and simply trying to hide that part of us by having a pristine sketchbooks with no mistakes or "only good drawings" seems pointless to me. Someone once told me to never scribble out your drawings, because you may change your mind about it later and discover it was a good idea after all. I tried to follow that idea with my sketchbooks, and it's paid off for me many times. Also, if you're interested in more of my sketchbook stuff, check out this post for my life drawing series. I really like this post! Your sketchbook is awesome. Love the frog and the tadpoles haha. I have two sketchbooks that I've started and put down years ago. After reading this post, I think i'll pick it back up and sketch out my ideas before I start a painting. Thanks for the inspiration.